There is probably no decision a senior manager makes with greater bearing on long term success (or failure) than determining who will be on your team. If things go right, you will be making a choice you will live with for years to come. Make no mistake, your subordinates are the ones that make or break you. They are the ones that implement your strategies, sort through your problems, and are often your strongest political allies or detractors. Yet every day I see managers rushing to get positions filled, making compromises and potentially crippling their own careers. I've never completely understood the logic behind doing this. Perhaps it is driven by complaints from existing employees over temporarily shouldering the extra load of a open job. Or it could be managerial laziness -- not wanting to engage in the hard work of finding a great candidate because of the necessary commitment of time and effort. I've even seen instances where a manager simply threw up his hands (figuratively, of course) in frustration, unable to separate good candidates from bad ones because... well, because candidates misrepresent themselves. All these reasons are nothing more than bad rationalizations for compromise. Those employees that are currently complaining because they're covering for an absence are the same ones that will soon be complaining about the "bad fit" candidate you hired. They're the same employees that will ask: "Why did it take you so long?" when you eventually fire the lazy candidate you hired in a rush. They're the same employees that will badmouth you to others, claiming they (and possibly you) "knew" that candidate was "no good." What manager can deny that their best employee accomplishes at least twice as much as their average employee (unless they have already managed to recruit a team of superstars)? And what manager could deny that their worst employee takes up twice as much of their time as the average? Isn't it worth the investment in time and effort to try to find those great candidates? Sure, candidates lie. So do companies when they try to recruit them. Both sides are guilty of shading the facts to meet what they think are the expectations of the other. Is that any excuse to compromise on your hire, accepting what appears to be "good enough" rather than continuing trying to uncover "great?" There are many ways to work around this problem, admittedly none of them foolproof. I've found all of the following to be helpful. Focus on what the candidate has done, not what they say. Look for a track record of hard work starting from an early age (pre-18). Check references yourself. Ask references for other names and call them, too. Be skeptical of "evaluation" tools. People are smart and are likely to try to game them. Run the other way at any hint of dishonesty. Look for people that are brave enough to disagree with you, but smart enough to know when to accept a decision. I'm sure there are many additional rules that could be added. Each of these appear because not using them resulted in a personal, bad hiring decision. No matter how complete the list, however, I'm convinced errors will still occur. Hiring is a flawed, human process. While we can continue to improve our recruiting skills, we will never achieve perfection. Here are a few of the larger hiring mistakes I've made, and the recruiting error that led to them. I hired an HR manager that tried to steal from the company within his first thirty days. The problem with that recruitment -- I was rushing to fill the job, and deferred judgement to my staff, letting them pick the candidate that they "liked the best." I also failed to personally check references, which might have tipped me off to the manager's unethical behavior. A general manager I hired ended up stubbornly focused on the wrong priority, and intentionally misled me about the status of a major project. In this case, I used a selection tool to screen out arguably better candidates. After a long search with many rejections, I accepted the candidate because he "scored well." Frustration with the testing screen-outs drove me to rush ahead with the first person that "passed." I should have dug more deeply into the reason he was leaving his current job, which would have uncovered his stubborn streak. An engineering manager I hired couldn't seem to make up his mind without testing the direction of wind (meaning, without getting my opinion) at every turn. He lacked the courage to have and pursue his own ideas, thoughts and opinions, and instead turned out to be a classic "yes man." In this case, which was early in my career, I simply didn't have the experience to recognize that the guy was telling me everything I wanted to hear during the interview. Adding to that was the fact that I was in a hurry to bring on board a successor for a manager I was planning to demote. 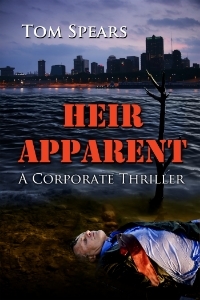 To the right is the cover for HEIR APPARENT. In this tale, someone is killing corporate leaders in Kansas City. But whom? The police and FBI pursue a "serial killer" theory, leaving Joel Smith and Evangelina Sikes to examine other motives. As the pair zero in on the perpetrator, they put their own lives at risk. There are multiple suspects and enough clues for the reader to identify the killer in this classic whodunnit set in a corporate crucible. January 31, 2014 by Tom Spears.